Fifteen: Mystère — The Old Town Alchemy Co.
Once upon a time, Cognac was the drink of choice for the higher orders of society and the undisputed leader among spirits, but that was before phylloxera decimated French wine production allowing whiskies and rums to come to prominence, and before the British government started to promote gin over imports from a country it frequently warred with. Cognac has heritage and tradition in spades which adds to the aura of luxury around the category, but it can also make the spirit seem fussy and impenetrable. Which is shame, because that previous dominance is based on the quality of the product rather than mere terroir or aging. So, I made a conscious choice to make something with a Cognac base which isn't something I do that often. Vermouth seemed like a no-brainer, wine-based modifier with a grape-based spirit. Keeping the complementary theme, I used some Mandarine Napoleon - a brandy-based liqueur not unlike Grand Marnier, only Belgian and more mandarine-y. Stir all ingredients with ice and strain into an ice-filled brandy glass. 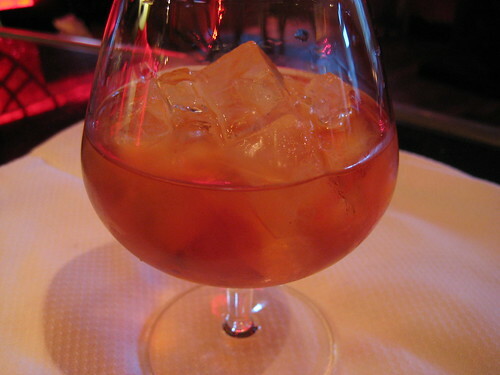 Posted on April 18, 2009 by Jon and filed under Fiftytwo, Mixology, Projects, Recipes and tagged Cognac Mandarine Napoleon vermouth.